Shaping a Viable Future for our Descendents? Today we stand poised on the cusp of a historical transition, most likely extending over multiple generations, in which human societies must find ways to adjust to radically different environmental conditions and accomplish far-reaching social, economic, political and cultural changes. Mitigating our dangerous disruption of the biosphere and adapting to the profound mutations we have already built into the Earth System are now urgent priorities for all humanity. We now face a limited window of opportunity for action over the next few decades if we are to avoid runaway changes in the biosphere that will radically change the conditions for life on Earth. 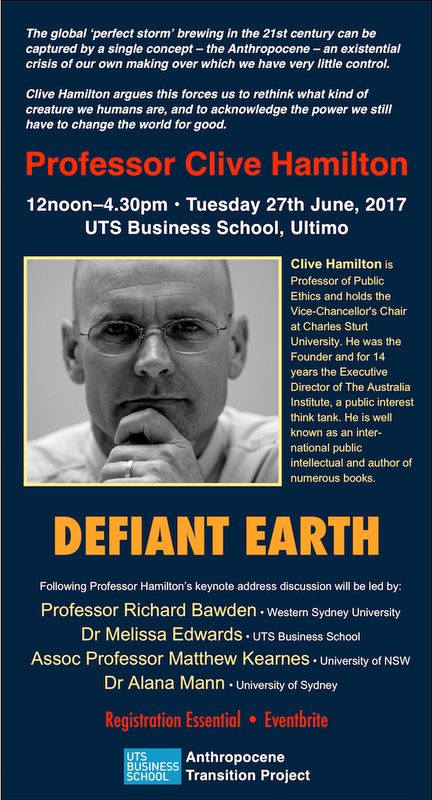 But what we could call ‘Anthropocene thinking’ looks beyond mitigation and adaptation to consider the transformation of the globally dominant but seriously dysfunctional ‘advanced’ human cultures. This is the central task humanity must accomplish in the Anthropocene Transition. 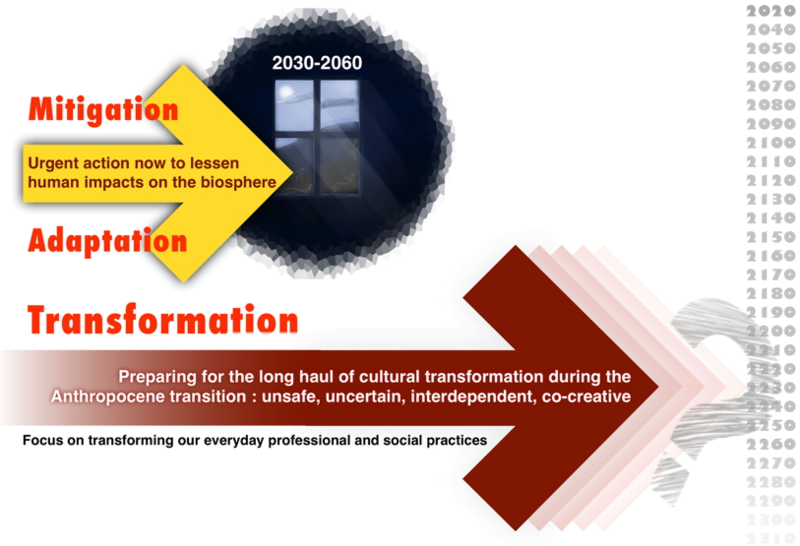 It is a transition away from professional and social practices and their underpinning cultural values that are fundamentally at odds with the continuing viability of our species and many others as well. Our ‘professional and social practices’ are all the activities, both paid and unpaid, in which specialised and tacit knowledge and skills are used to achieve socially and culturally valued outcomes. These activities are often collaborative in nature and usually involve some degree of critical reflection and collective learning. ‘Professional and social communities of practice’ refers to the networks that link people involved in common or similar activities. It is through these activities and networks that most of us participate in continuously reproducing and reinventing the institutions and values of our society. These are the ways in which we all most directly contribute to shaping the future. "Ecological thinking is the science of the relationship between organisms and their local environment or eco-system. 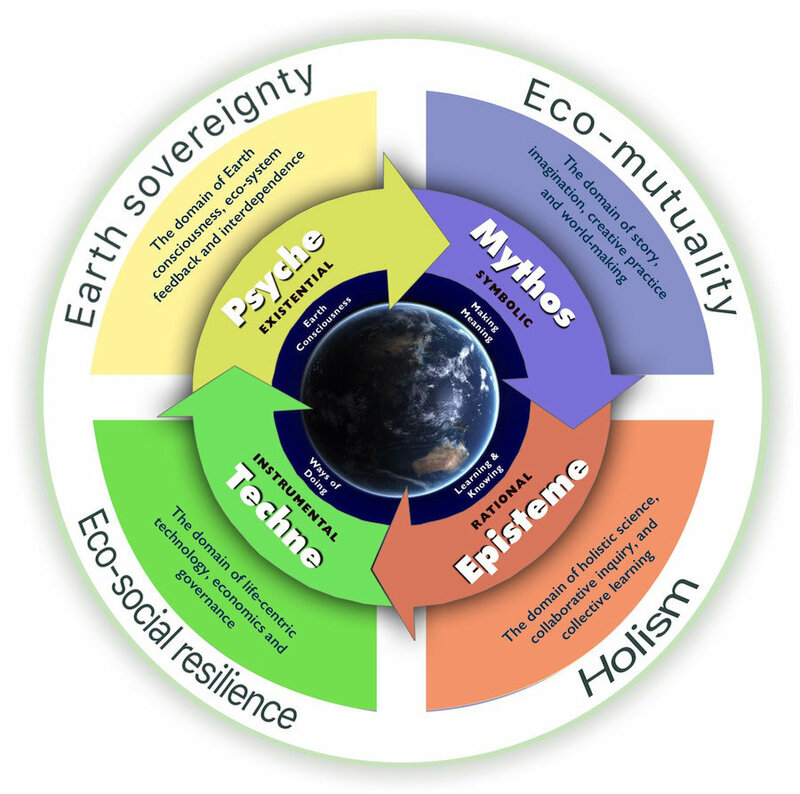 Earth System thinking is the science of the whole Earth as a complex adaptive system beyond the sum of its parts. Ecological thinking cannot simple be scaled up and applied to the Earth System. A new kind of thinking is required." The term ‘Anthropocene’ arose from the Earth System science and has been widely adopted across the social sciences and humanities. While the Industrial Revolution began the rapid expansion of a powerful, increasingly globalised, industrial civilisation based on the exploitation of fossil fuels, it was the 1950s that saw the start of ‘the Great Acceleration’ – exponential growth in energy use, industrial output, consumption, population, and eco-system disruption, the unleashing of nuclear power, and a flood of fossil-fuel based plastics and chemicals into the environment. In the Anthropocene human activity is outstripping the biosphere’s capacity to maintain the relative stability we’ve known during our species’ long journey through the Holocene. Our impacts are pushing the Earth System towards rapid, unpredictable and potentially catastrophic state changes beyond the evolutionary experience of both humans and many other species. ‘Anthropocene’ is a powerfully integrative concept. 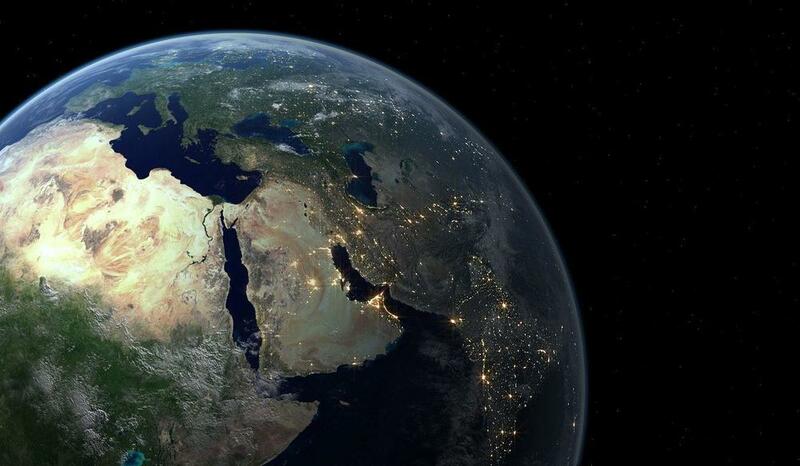 It draws together our thinking about specific aspects of Earth System disruption — like climate change or biodiversity loss or ocean acidification — to focus on their interconnections and their cultural drivers. By directing our attention to whole system dynamics, it encourages us to see the Earth as a single socio-ecological system. The Anthropocene concept has far-reaching ethical implications. It challenges us to accept an expanded understanding of collective responsibility that reaches beyond conventional human scales measured in multiples of human lifetimes, to consider the consequences of our collective actions on planetary and geological (or deep time) scales. Culture is a civilisation's shared way of making sense of the world: of what is real, what is knowable, and what has value. It conditions our ways of being, seeing and doing. It determines what we consider appropriate action in and on the world. It defines the taken-for-granted limits of the possible and the acceptable. Changing our shared culture — “the way we do things around here” — involves more than sustainable business models, low carbon economies, and appropriate technologies. All these are vitally important areas of innovation in this age of transition, but in themselves they are not sufficient. Our challenge is ultimately to rethink our core cultural values and how they translate into action in the world. The globally dominant industrial growth economies operate as if reality is about organising inert matter in efficient ways to satisfy human needs and wants and generate surplus value. This cultural ‘operating system’ couples our everyday taken-for-granted assumptions about the world to an ideology of dead matter, human utility and perpetual growth. The fundamental challenge of the Anthropocene is to restore a commitment to the vitality of life in all its forms on this planet as the basis of our institutions and professions. This is the cultural renaissance the Anthropocene calls forth. For decades our principal response to this looming existential threat of our own making has been a grab bag of policies, processes, practices and products bearing the label ‘sustainable’. But ‘sustainability’ as both a concept and a practice generally falls short of the mark. As Christopher Wright, co-author of Climate Change, Capitalism, and Corporations: Processes of Creative Self-Destruction, suggests, many of the policies and practices of sustainability are really about being less un-sustainable. As such they fail the test of proportionality — valuable but inadequate in the context of the challenges of cultural renewal and systemic redesign we face. The true worth of many sustainability initiatives lies not so much in their intended outcomes as in the opportunities they open up for essential professional and social co-learning, particularly when embedded in value networks which have the potential to become social learning communities. 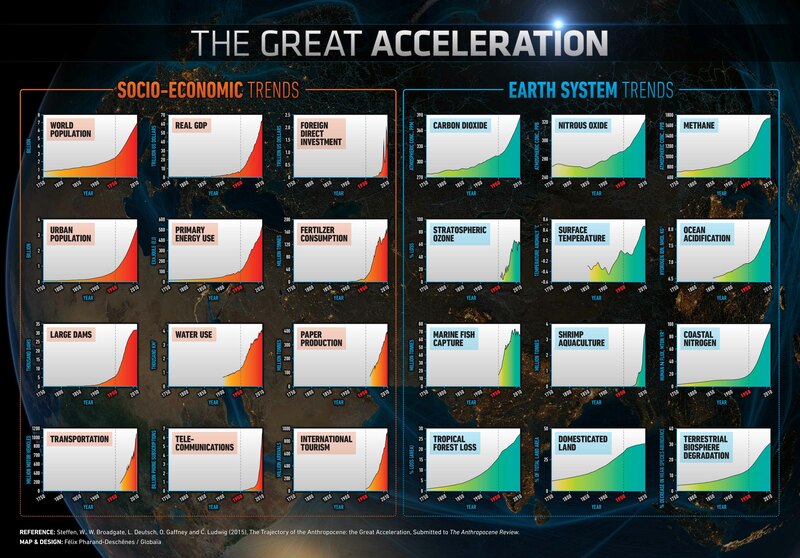 Even as the magnitude of the Anthropocene challenge becomes clearer, in our everyday professional and social lives we continue to reproduce the status quo. Business as usual is very much the order of the day — perhaps with some “sustainable” trimmings at the margins. 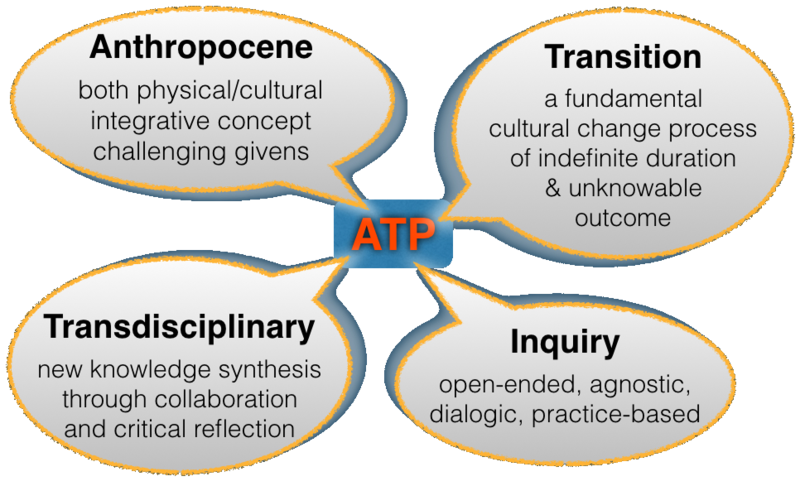 The Anthropocene Transition Project is based on the understanding that business as usual is no longer a viable option. It aims to inspire and inform new trans-disciplinary thinking and experimentation in the redesign of our professional and social practices. Trans-disciplinarity in this context implies the emergence of new knowledge syntheses drawing on the cultural resources of diverse disciplines and traditions, including the traditional knowledges of indigenous peoples. It needs to be distinguished from multi-disciplinary approaches that employ the lenses of different disciplines to examine a problem, and interdisciplinary methods that promote a dialogue between disciplines. 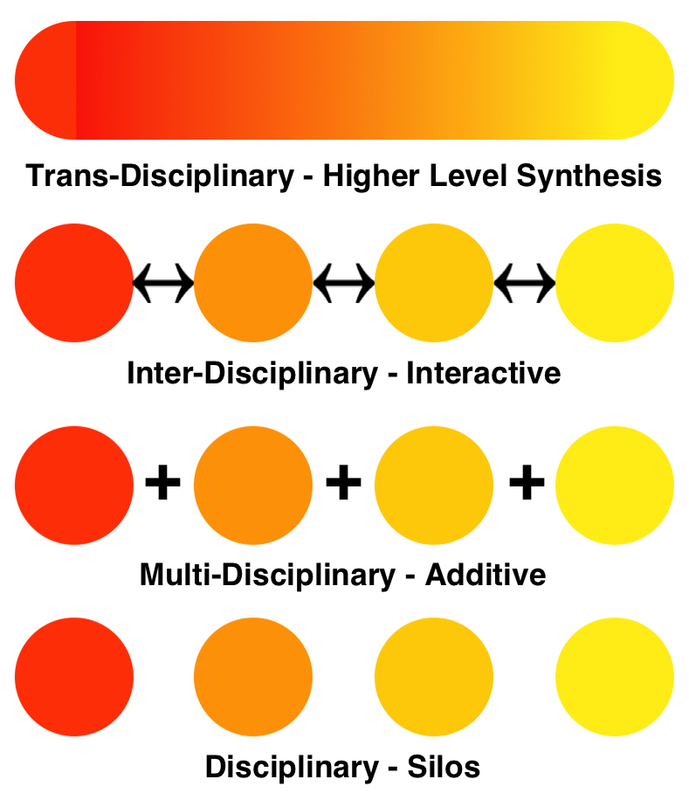 In simple terms multi-disciplinary denotes additive, inter-disciplinary interactive, and trans-disciplinary holistic. 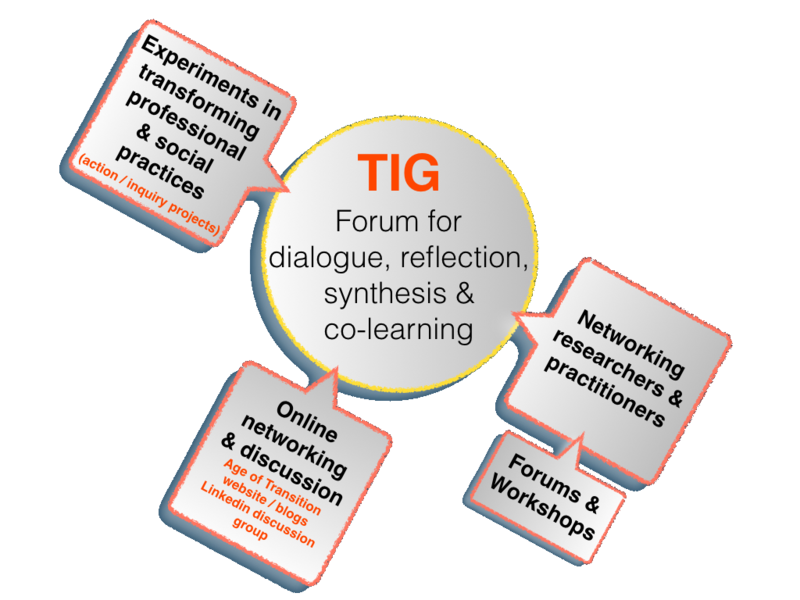 The core of the project is a Transdisciplinary Inquire Group (TIG) that meets every 4-6 weeks. Here scholars and practitioners gather to report and reflect together on their experiences in a diversity of initiatives ranging from academic research to projects in organisations, workplaces and communities that aim to stretch the envelop of conventional thinking and practice. 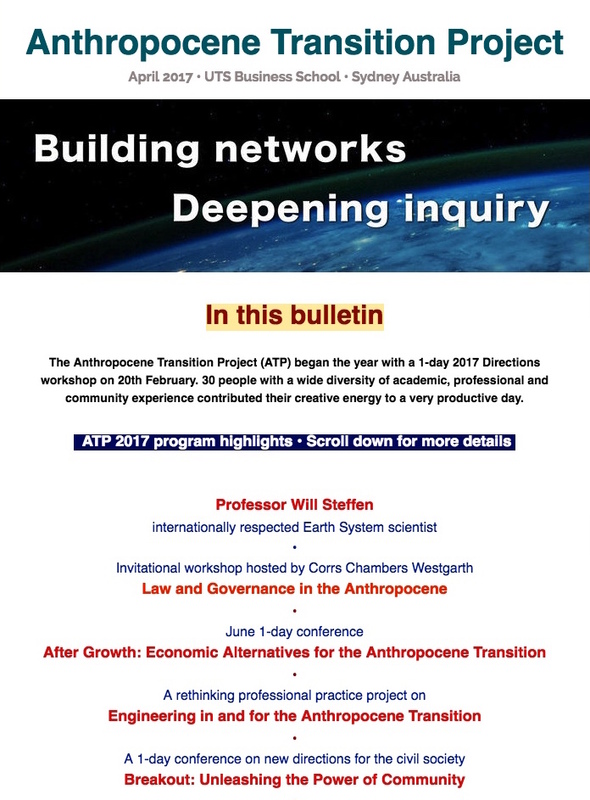 As the Anthropocene Transition Project develops it will build a network of connections for the exchange of information and ideas and encourage new partnerships and collaboration. This networking will utilise both face-to-face forums and workshops and online discussion. The project is linked to the Age of Transition website which includes a blog and a web digest updated twice weekly. There is also a Preparing for the Anthropocene Transition discussion group on the Linkedin platform with over 1,000 members. © Copyright UTS - CRICOS Provider No: 00099F - 17 January 2019 05:03 PM. The page is authorised by Deputy Vice-Chancellor and Vice-President (Corporate Services).